Over the last couple of weeks, I’m pretty sure I have developed a few new grey hairs. My nails have been bitten down into messy, spiky shards and my heart has been beating a tiny bit faster whenever a new email pings into my inbox. Because I’m suffering from a state that most authors will recognise: a classic case of ‘I Have Sent My New Book To My Editor And Will Be Hearing Back From Her Any Day Now-Itis’. Or IHSMNBTMEAWBHBFHADNI for short. Interesting things happen during an outbreak of IHSMNBTMEAWBHBFHADNI. One of them is that you look around your study and realise that it doesn’t look much like a study. You know on those cop dramas when the police suspect a criminal of hiding drugs or stolen goods or something and they go round to the criminal’s home and ransack the place? Drawers pulled out, clothes strewn around the room, photo frames knocked over, shelves upended, piles of paperwork flung across the floor. Yeah, that’s kinda what your study looks like. I once heard the wonderful poet and author Jackie Kay talk about writing a first draft. She described it as being similar to organising a huge dinner party – but without doing any cleaning up along the way. After the party, when everyone’s gone home, you look around the kitchen and don’t even know where to start. 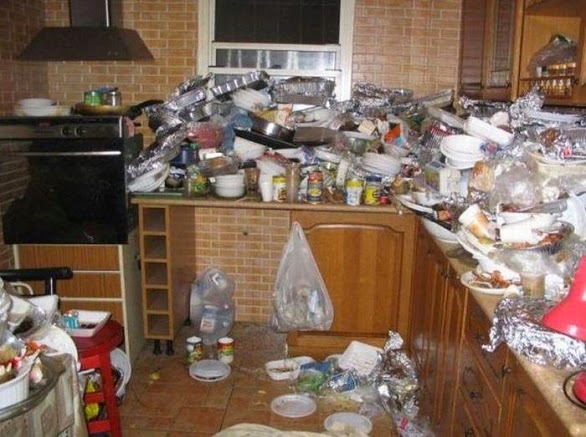 NB This is a random picture downloaded from the internet, not actual Jackie Kay's kitchen after a dinner party. My study is a scene of devastation, filled with long trails of things that I have been ignoring/avoiding/not noticing for weeks. In those last few days of the first draft, where I’m working flat out every daylight hour - and a few of the pre-dawn ones, too - I put on my blinkers as I enter my study, carve a very careful path along the narrow channel that is not filled with paperwork glaring expectantly at me, sit down in my chair and start tapping away, noticing only the screen in front of me. And the continually-replaced cup of tea by my side. Actually, if I’m honest, in those last few days, when I’m working into the evening, it’s just as likely to be a bottle of beer by my side. And then there is that magical moment. With a tiny tear in the corner of your eye that you’re never quite sure if you should really have (I mean, crying at your own book – is that even allowed?) you type, ‘the end’. The euphoria doubles as you write an over-emotional (you’re on your second beer of the evening) email to your editor, attach your baby – aka the manuscript that has taken over the last eight months of your life – and hit ‘send’. Obviously, you don’t do anything much for the rest of that day. A good friend and special writer-buddy of mine, Lee Weatherly, once told me that you have to have a bottle of champagne when you finish a draft of your book. It’s virtually the law. And I don’t like breaking the law. Champagne, beer, whatever. Bring it on. This moment has been nearly a year coming. It's time to celebrate! So let’s skip to the next morning. You know you have a fortnight or so before you’ll hear back from your editor. Actually, on this occasion, we're on a really tight schedule so it's more like ten days. Either way, it's time to mop up the mess. For at least the last month, you’ve told yourself that this is the point when you will attack the email inbox, fill in the forms, sign the contracts, send off the tax stuff, return those shoes you should never have bought. Maybe even, I dunno, clean the house? Ten whole days. Your life is going to be SO sorted by the time you hear back from your editor. You're practically going to be a Stepford Wife. I love good intentions. Don’t you? Here’s what I’ve spent the last ten days doing. Letting the dog on the bed so she won’t nag me for walkies. Mooching around the house in my PJs vaguely thinking about getting the vacuum cleaner out. Ha! As if. Meeting up with friends for coffees in the morning. In the morning! Watching Dragon’s Den recordings with my lunch. With my lunch!!! Reading multiple copies of The Bookseller and Practical Photography which have been arriving and being ignored every week for the last three months. 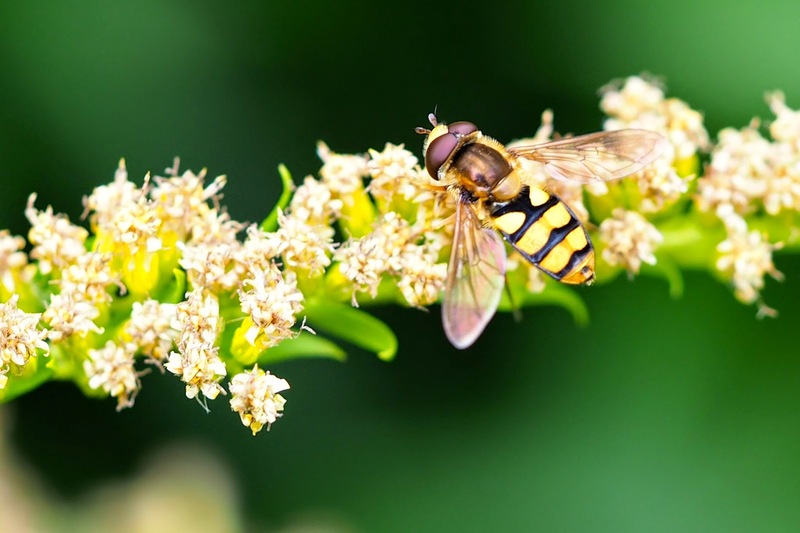 Wandering around the garden with my new macro lens, taking photos of spiders, wasps and flowers. Plenty more where this came from. If you want to see them, just ask. And yes, just to make sure I feel I’ve achieved something this week, replying to at least two thirds of the emails that have been patiently waiting for me whilst I was busy getting my half-girl half-mermaid heroine out of trouble. And then, before you know it, it happens. The email. Ping. Fourteen pages of notes. Bam. A very deep breath. And back in we dive. Who wants to live in a tidy house with clothes all put away in drawers, receipts filed away in envelopes and email inboxes sparse and empty, anyway? Not me, it seems. Someone pass me a beer. I’m going in. Almost anything is better than doing housework! I love the saying "dull women have beautiful homes" - it's because we're just too interesting that our houses are less than pristine. Sadly, however, I do have some friends who manage to do both, so perhaps it's just wishful thinking... Good luck with the edits.